It is a common misconception that all hand dryers are the same. They are not. Gone are the days of ‘one size fits all’ washroom hand dryers, today there are many makes and models of hand dryers to choose from. Technology, innovation and design in the hand dryer market means that improvements and custom hand dryers are appearing on the market. If you are looking for a low traffic automatic hand dryer there are several considerations to take in to account. 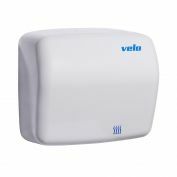 With a little research and knowing to look in the right places you will find that the best low traffic cheap hand dryer can be found at Velo. When you start researching toilet hand dryers, it may be overwhelming to see all the different sizes, makes, models and features. Rather than look at what is out on the market. A good tip is to think about what you need in your low foot traffic area. If the dryer is used less than 100 times a day, it is considered low traffic. Low noise. Most low traffic bathrooms are not large areas. They are often in small offices, or small commercial premises such as a doctor surgery, dentist, or a local cafe. In small spaces, people are a little closer to each other and often sat right near the bathrooms. Low noise makes for a pleasant experience for both the user and the people that work near the vicinity. Low maintenance. Most small businesses don’t have a facilities manager on site or a team of cleaners on-site frequently. 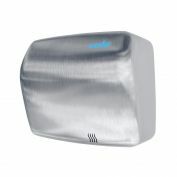 Having a low maintenance and long warranty hand dryer takes the headache away from maintaining your bathroom. Energy Saving. You don’t want to install washroom hand dryers which then spike your energy bills and eat into your profits. Do your research and look for low energy hand dryers. Velo Kai hand dryers are perfect for low traffic areas and match all the features required for a comfortable, hygienic experience for patrons at low cost, maintenance and energy bills!